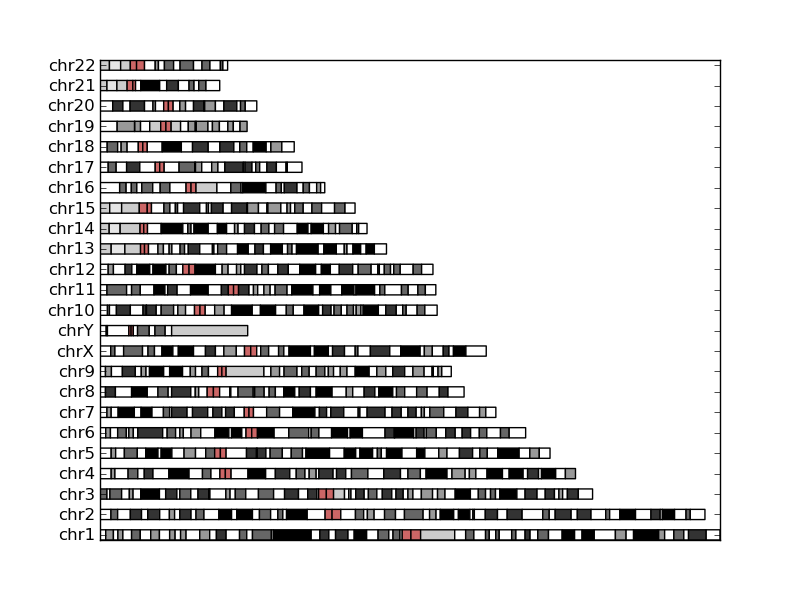 Question: Visualize Chromosome With Python ? Is there library could visualize chromosome like in above thread in python ? Mainly, draw chromosome, mapping gene, color/dot plot on interest region. If not, is it possible to do that in matplotlib ? center = yrange + yrange/2. I don't know details about the staining (so my colors are probably off), but this should hopefully get you started. Since it's off-the-shelf matplotlib and the x-axis is in bp, you can easily add lines/annotations for your own data. Thanks, exactly a great start for me. This is very nice, thank you for posting it. Wow, very nice, thank you! I needed something similar. There is Easyfig which is basically a GUI for genome annotation and comparison. You might be able to reuse some of it's code. And there's AnnotationSketch (part of genometools), which has Python bindings according to the website. If you want to code your python scripts to fix this,I know two ways : 1 use the 3rd lib to plot, like matplotlib, pysvg , ... ; 2 generate svg (xml) script directly (need to know SVG grammar). I like the latter . how to draw graph from dataset file in python by matplotlib?